The Goulburn Broken Region has a great diversity of soil types that reflect differences in parent material, topography, climate, organic activity and time e.g. degree of weathering. Sodosols are widespread in the north and west of the region, especially on the Riverine Plains. In the higher rainfall areas in the south east of the region, Acidic Dermosols are prevalent. 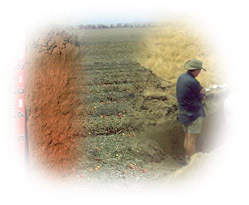 For agricultural purposes, many of these soils have some chemical and physical limitations (e.g. sodicity, acidity) which require careful management.